If you have a power supply with isolated outputs, you essentially have several different power supplies – to the pedals, each output appears as its own separate power supply. This is a good setup, since keeping the pedals on their own isolated power sources stops them from interacting through the power lines. But those outputs are not limited to just powering one pedal each – there are lots of ways you can use isolated outputs to expand the capabilities of your chosen power supply. You might have heard about splitters, voltage doubler or current doubler cables, and here’s a rundown of how they work and how to use them. This basically does what it says on the tin – it splits one output into two. Or more, in the case of a daisy chain cable. 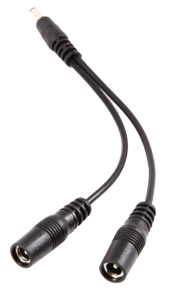 Even though the daisy chain cable looks like a series of plugs, they are not actually wired in series. It’s a little easier to see in the splitter pictured to the right, where the 1-into-2 setup is visible to the naked eye. But like a 1 -> 2 splitter cable, a daisy chain’s plugs are all wired in parallel. The cable can be all male plugs (one towards the power supply, the other two to the pedals), or it can have female jacks where you connect normal power supply cables to. But the principle is the same. There’s always one exception, though. Some splitter cables are ground lifted – meaning the first plug gets both the positive and negative wire, while the second plug only has the positive wire. This would normally mean the second pedal wouldn’t power up, but once the signal cables are hooked up, the ground/negative is restored. The theory here is that this lowers noise/hum due to ground loops. I have to say honestly that I have never had that problem, so I can’t say whether it helps or not. But now you know what they are, and how they work. When you stack two AA batteries end to end in a flashlight, the two 1.5v cells make up a single 3v cell. The positive of one battery connects to the negative of the other, while the remaining two contact points are used as the main positive and negative. The resulting voltage is the sum of the two batteries’ voltages. It works the same with isolated outputs on a power supply. By using a voltage doubler cable – which places the two outputs in series – you can create one 18vDC output from two 9vDC ones. The current capacity doesn’t change, though – if both outputs are 9vDC/100mA, you’ll end up with one 18vDC/100mA output. The term ”doubler” is actually not 100% correct – ”combiner” would be more accurate (although I doubt it’ll catch on), since you can combine one 9vDC and one 12vDC output if you like. Then you’d get a 21vDC output. But I suspect ”voltage doubler” is the favoured term simply because most of use use them to combine two 9vDC outputs into a single 18vDC one. While the voltage doubler puts two outputs in series to double (add together) the voltage, the current doubler instead puts the two outputs in parallel. That way, the voltage stays the same, while the available current doubles. So two 9vDC/100mA outputs will now combine into a single 9vDC/200mA output. Knowing the difference between the two types of doubler cables is important, since you may otherwise inadvertently feed 18vDC to a pedal that can’t handle it. So make sure you know which is which. The current doubler is basically the same as the splitter, and the two can be interchanged (except for the ground lifted type of splitter, which should only be used as intended). The voltage of the two outputs need to be the same (e.g. 9vDC), otherwise the higher voltage output will attempt to push voltage into the lower voltage one, which would not be good. As for current, there’s a big debate on whether you can combine outputs with different capacities or not, and what happens if you do. Some argue that a 9vDC/100mA output and a 9vDC/200mA output would create a 9vDC/300mA output, while others (myself included) argue that the usable max capacity of that combination would be 9vDC/200mA. Here’s the reasoning: again, electricity strives to be shared evenly, so the load will attempt to spread evenly across the two outputs. This works fine up to 200mA, where each output contributes 100mA. But when the load goes past that point, the 100mA output will start to run out of puff, and as the load increases, its voltage will drop and it will introduce hum. So when current doubling/combining, the max useable capacity is twice that of the lowest capacity output. Not convinced? Let me make a speaker wattage analogy. If you load a 2×12″ cab with one 25w speaker and one 75w speaker – both the same impedance (e.g. 8 or 16 ohms) – the resulting total wattage rating for the cab isn’t (as one might think) 100w, but 50w. This is because the two speakers will share the load equally. So at 50w input, both speakers will see 25w each. It should be said that I’ve also read some compelling arguments that combining two power sources in parallel actually works in a different way. Basically, the source with the highest voltage will be asked to carry the entire load, until the point that its voltage starts to drop as it can no longer keep up with the demand. At that point, the other source will kick in (as it is now the one with the higher voltage. Until it runs out of steam, and its voltage drops below the first source, and the cycle continues. Either way, I don’t recommend running two outputs in parallel unless they are the same voltage and capacity. To me, it seems like the cleanest and quietest way to run things. What if I need different plugs? Most power supplies use the same barrel type plugs/jacks for the outputs as used in the pedals. This means the regular cables that come with the supply will have the same type of (male) barrel plugs at both ends. 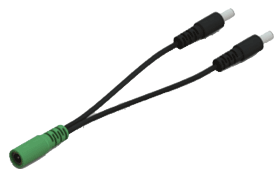 Splitter/doubler cables can also have male plugs at both ends, or – as in the examples shown above – male plug(s) for the power supply end and female cable jack(s) towards the pedal. With the latter, you’ll also need to use a regular male <-> male cable to connect to the pedal. There are also special cables available for pedals that need a different plug size and polarity – for instance the Electro-Harmonix Deluxe Memory Man variants that use 24vDC with a center positive 2.5mm jack. To get to 24vDC, you need two (isolated) 12vDC outputs with a voltage doubler cable. 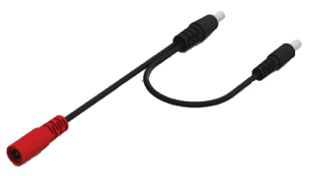 You could then use a special converter cable that turns the regular center negative 2.1mm plug into a center positive 2.5mm one. Or you could get a cable that does it all in one, such as the one to the right. It works exactly the same as the normal voltage doubler cable, but the plug for the pedal end is different (2.5mm center positive instead of 2.1mm center negative). So far, we’ve only talked about power supplies that have the same DC/barrel type jacks for their outputs as are used in the pedals. But if you have a Cioks power supply, the pedal and power supply ends are different – they use RCA type jacks for the power supply outputs. RCA type jacks make a very secure connection to the power supply output, but also mean you have to use their cables or wire your own up. If you solder your own cables for a Cioks power supply, be aware that the RCA jacks carry the positive on the center pin, so you’ll need to remember to cross the wires over (so the positive ends up on the sleeve/barrel at the pedal end). Unless you intentionally want to create a center positive plug, of course. Anyway, Cioks carry the same setup of doubler/splitter cables as for the others, but as mentioned, this time the power supply and pedal ends are easy to tell apart. The pic to the right shows a voltage doubler cable from Cioks. They also have variants with all RCA plugs (male towards the power supply, female towards the pedal), to which you then connect the regular Flex cable needed for the pedal in question. With Cioks, it is easy – just buy what you need from their extensive range of ”Flex” cables, and you’re set. I doubt you’d find any cheap Amazon or Chinese options for Cioks, since the RCA plugs makes them such a speciality item. The downside to this is that there are no super cheap ”5 for the price of 1” Ali Express offers out there. The positive side is that you know what you get, and you know it will work (as long as you order the right stuff, of course). No nasty surprises. Of course, even with a Cioks, you can use anything that starts with a female cable jack. 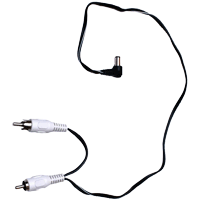 So if you are shopping for a splitter cable and find one with one female jack and two male plugs, it will work. Likewise, a reverse polarity converter (for center positive pedals) or 3.5mm converter (for a RAT) will also work, if it starts with a female jack. But beware – some of the cheaper ones out there are cheap for a reason, and I have seen all sorts of miswired stuff over the years. Most commonly, they reverse the polarity when they are not supposed to, or don’t when they are supposed to. For instance, a 2.1mm DC jack -> 3.5mm plug converter needs to be wired so the positive (which comes into the DC jack on the sleeve/barrel) is connected to the tip of the 3.5mm plug. Quite often with cheap stuff, they’ve simply wired the two sleeve to sleeve and center to tip, meaning you’ll be sitting with a converter that doesn’t work for your RAT. TL;DR version: Unless you are prepared (and able) to use a multimeter to verify each splitter/doubler/converter cable you buy, buy proper factory stuff from a reputable source. I suggest Cioks for Cioks stuff, Voodoo Lab or Truetone for cables to most other supplies, and Truetone for converter cables. Yes, you will pay a little more over the Amazon cheapos, but you know it will do what it says and work as intended.